The changing seasons affect more than just whether or not you wear a sweater when you go out to check your mail. In fact, the shift from winter to spring, spring to summer, and so on has a distinct effect on the housing market and the process of moving at large. Here, let us break it down for you. Did you know that statistically it’s cheaper to buy a house in winter? In fact, professors from the London School of Economics, L. Rachel Ngai and Silvana Tenreyro, have spent a lot of time developing a paper on the topic. According to their research, because fewer people tend to look to buy homes during the colder months of the year, the homes that do go up for sale during that time are likely to have lower prices to draw potential buyers in. On the flip side, a huge drawback of renting or buying in the winter time is that it’s cold. Nobody likes carrying a couch up a flight of stairs when it’s 20 degrees outside, and it’s a lot less fun to go out looking for properties when you’re shivering from showing to showing. Spring and fall are being grouped together, because they share similar characteristics that the other two seasons out of the year do not. They have milder weather and fewer big events going on. 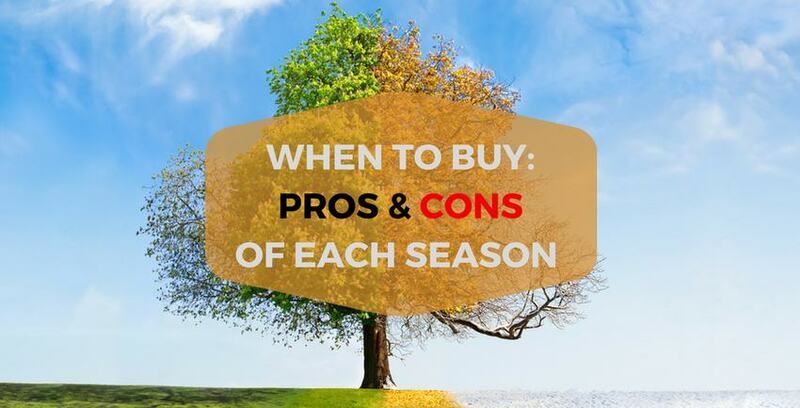 This leads to one of the biggest benefits of looking for a new home or looking to move in these seasons: there is less competition. People tend to make big life choices (like a move) during times when they have a considerable amount of time off, such as during summer break or winter holiday. Spring and fall don’t afford people these types of breaks, so typical moving services or rental properties tend to go for lower prices to fill that lull in business. Of course, while this is great for someone looking to get a good deal on movers, it does mean that if you’re looking for a rental or new home you’re less likely to find something because of all the folks who just moved in at the end of summer. I bet you can already guess what one of the biggest pros of searching for a home or actually moving is during the summer time. You’re right: it’s the weather! Moving in the summer is great when you can put on a pair of shorts and a t-shirt, enjoying the breeze roll through the open doors as you check out open houses or carry your boxes into your new domicile. Summer is the peak season for movers, though, and everybody is busy. If you’re hoping to get things moving quickly, you might find yourself on a movers’ waiting list if you decide to move during the summer. Plus, a lot of homes and open rentals get a lot of attention during the summer because it’s the time of year where the most people have the most availability. In the end, it mainly comes down to your weather preference and whether or not you’re willing to compete with others looking for the same services you are. Whenever and wherever you’re planning on moving, Storage Direct has moving supplies and storage services available to help you put your stuff exactly where you need it to be.